I've been meaning forever to try making a "barn door" tracking mount. 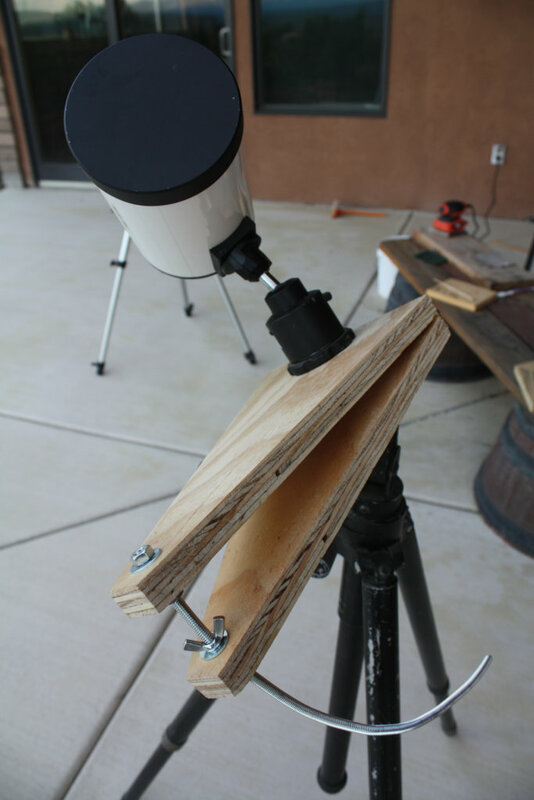 Used mainly for long-exposure wide-field astrophotography, the barn door mount, invented in 1975, is basically two pieces of wood with a hinge. The bottom board mounts on a tripod and is pointed toward the North Star; "opening" the hinge causes the top board to follow the motion of the sky, like an equatorial telescope mount. A threaded rod and a nut control the angle of the "door", and you turn the nut manually every so often. Of course, you can also drive it with a motor. We're off to view the eclipse in a couple of weeks. Since it's my first total eclipse, my plan is to de-emphasize photography: especially during totality, I want to experience the eclipse, not miss it because my eyes are glued to cameras and timers and other equipment. But I still want to take photos every so often. Constantly adjusting a tripod to keep the sun in frame is another hassle that might keep my attention away from the eclipse. But real equatorial mounts are heavy and a time consuming to set up; since I don't know how crowded the area will be, I wasn't planning to take one. Maybe a barn door would solve that problem. Perhaps more useful, it would mean that my sun photos would all be rotated approximately the right amount, in case I wanted to make an animation. I've taken photos of lunar and partial solar eclipses, but stringing them together into an animation turned out to be too much hassle because of the need to rotate and position each image. I've known about barn-door mounts since I was a kid, and I knew the basic theory, but I'd never paid much attention to the details. When I searched the web, it sounded complicated -- it turned out there are many types that require completely different construction techniques. The best place to start (I found out after wasting a lot of time on other sites) is the Wikipedia article on "Barn door tracker", which gives a wonderfully clear overview, with photos, of the various types. I had originally been planning a simple tangent or isosceles type; but when I read construction articles, it seemed that those seemingly simple types might not be so simple to build: the angle between the threaded rod and the boards is always changing, so you need some kind of a pivot. Designing the pivot looked tricky. Meanwhile, the pages I found on curved-rod mounts all insisted that bending the rod was easy, no trouble at all. I decided to try a curved-rod mount first. The canonical reference is a 2015 article by Gary Seronik: A Tracking Platform for Astrophotography. But I found three other good construction guides: Optical Ed's "Making a Curve Bolt Barn Door", a Cloudy Nights discussion thread "Motorized Barn Door Mount Kit", and Massapoag Pond Photography's "Barn Door Tracker". I'm not going to reprise all their construction details, so refer to those sites if you try making your own mount. The crucial parts are a "piano hinge", a long hinge that eliminates the need to line up two or more hinges, and the threaded rod. Buying a piano hinge in the right size proved impossible locally, but the folks at Metzger's assured me that piano hinges can be cut, so I bought one longer than I needed and cut it to size. I used a 1/4-20 rod, which meant (per the discussions in the Cloudy Nights discussion linked above) that a 11.43-inch radius from the hinge to the holes the rod passes through would call for the nut to turn at a nice round number of 1 RPM. I was suspicious of the whole "it's easy to bend the threaded rod ina 11.43-inch circle" theory, but it turned out to be true. Draw the circle you want on a sheet of newspaper, put on some heavy gloves and start bending, frequently comparing your rod to the circle you drew. You can fine-tune the curvature later. I cut my boards, attached the hinge, measured about 11.4" and drilled a hole for the threaded rod. The hole needed to be a bit bigger than 5/8" to let the curved rod pass through without rubbing. 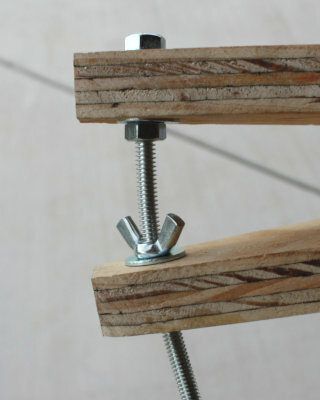 Attach the curved rod to the top wood piece with a couple of nuts and some washers, and then you can fine-tune the rod's curvature, opening and closing the hinge and re-bending the rod a little in any place it rubs. A 5/8" captive nut on the top piece lets you attach a tripod head which will hold your camera or telescope. A 1/4" captive nut on the bottom piece serves to attach the mount to a tripod -- you need a 1/4", not 3/8": the rig needs to mount on a tripod head, not just the legs, so you can align the hinge to the North Star. (Of course, you could build a wedge or your own set of legs, if you prefer.) The 3/4" plywood I was using turned out to be thicker than the captive nuts, so I had to sand the wood thinner in both places. Maybe using half-inch plywood would have been better. The final piece is the knob/nut you'll turn to make the mount track. I couldn't find a good 1/4" knob for under $15. A lot of people make a wood circle and mount the nut in the center, or use a gear so a motor can drive the mount. I looked around at things like jam-jar lids and the pile of metal gears and sprinkler handles in my welding junkpile, but I didn't see anything that looked quite right, so I decided to try a wing nut just for testing, and worry about the knob later. Turns out a wing nut works wonderfully; there's no particular need for anything else if you're driving your barn-door manually. Testing time! I can't see Polaris from my deck, and I was too lazy to set up anywhere else, so I used a protractor to set the hinge angle to roughly 36° (my latitude), then pointed it approximately north. I screwed my Pro-Optic 90mm Maksutov (the scope I plan to use for my eclipse photos) onto the ball head and pointed it at the moon as soon as it rose. 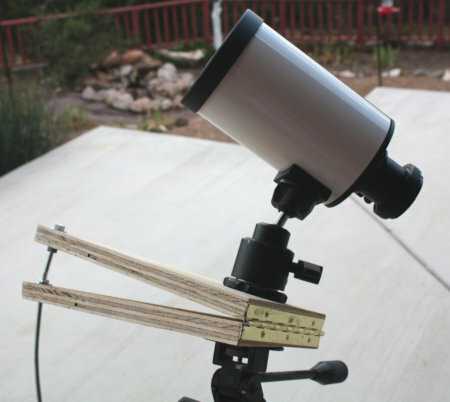 With a low power eyepiece (20x), turning the wing nut kept the moon more or less centered in the field for the next half-hour, until clouds covered the moon and rain began threatening. I didn't keep track of how many turns I was making, since I knew the weather wasn't going to allow a long session, and right now I'm not targeting long-exposure photography, just an easy way of keeping an object in view. A good initial test! My web searches, and the discovery of all those different types of barn-door mounts and pivots and flex couplings and other scary terms, had seemed initially daunting. But in the end, building a barn-door mount was just as easy as people say it is, and I finished it in a day. And what about a motor? I added one a few days later, with a stepper and an Arduino. But that's a separate article.